Mayer Jacobovits, of Israeli Wines Direct, held a private wine tasting – yesterday – at Liquors Galore (1212 Avenue J, Brooklyn 11230 – Tel: 718.338.4166). Aside from Mayer, the two store operators and I were present. Set on Moshav Agur in the Judean plains, this boutique winery has been kosher since 2007 under the direction of owner/winemaker Shuki Yashuv. I first tasted their wines about three years ago and was unimpressed, this winery has since matured and now produces some good potables. The 2012 Layam, with a deep purple color, is floral on the nose exhibiting notes of red fruits, spices and herbs. It showed an unexpected, but subtle, salty finish. Founded on Moshav Ramot Naftaly in the Upper Galilee – in 2003 – by vintner Yitzchak Cohen, this small winery has been producing kosher wines since 2009. The 2012 Malbec was as interesting as it was unanticipated. A round, gentle Malbec with strong Mediterranean overtones, it was very distinct in character from any of its Argentinian cousins. With light earthy tobacco notes on the nose, it exhibits some spicy wood, gentle gripping tannins with generous blackberry and purple plums. Easy to drink and very good! Next we tried the Ramot Naftaly Barbera 2013. Rather earthy and laden with minerals, it exhibits crushed blackberries and licorice notes. It opens with a bit of bottle stink that quickly dissipates and gives way to generous fruits, a very likable wine. Worthy of special mention are the Petit Verdot 2012 and Shiraz 2012. The Petit Verdot showed soft tannins, aromas and flavors of raspberries and crème patisserie. The Shiraz 2012, dark garnet in color, medium to full-bodied (leaning towards full) with well balanced tannins and subtle notes of sweet cedar. With notes of plums, cassis, spices on the nose and palate it shows saddle leather on the finish. I appreciated the Shiraz 2012 most even though the Cabernet Sauvignon SE 2012 was selected by The Jewish Week TOP 18 Red wines $25 and over. 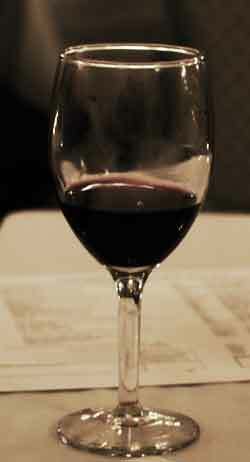 The Shiraz is easy and delightful on the palate with its soft tannins, it exhibits red berry, plum and licorice notes. Some nice wines you might want to enjoy over Pessach and beyond. It’s snowing out there, it’s obvious that dinner must consist of a hearty comfort dish, and it has to be something special since one of my granddaughters and her husband are coming over. I always liked cooking with wine, and my granddaughter shares my love of lamb, what better occasion then, could present itself to prepare this delicious recipe emailed by S. Lefkowitz, from Miami, Fl? She writes that it was adapted from Pam Anderson‘s Perfect One-Dish Dinners. Photo sent in by S. Lefkowitz from Miami, FL. 1. – Adjust oven rack to lower-middle position and heat oven to 450 F. heat a large heavy roasting pan set over two burners on low heat. Meanwhile, place shanks in a medium bowl with the 2 tablespoons of oil and turn to coat. Season with salt and pepper generously. 2. – A few minutes before searing shanks, increase heat to a medium-high until wisps of smoke rise from the pan. Add shanks and sear on all sides until well browned, 7 to 8 minutes total. Transfer to a bowl. Shanks should have rendered enough fat to cook onion. if not add another tablespoon of oil. 3. – Add onions, carrots an celery to roasting pan and cook while stirring until browned, about 5 minutes. Add garlic and Italian seasoning until fragrant about 1 minute. Whisk in flour, then broth, wine and tomatoes. Season with salt and pepper to taste. 4. – Return shanks to pan, Using two potholders to protect hands, place a sheet of heavy-duty foil over pan, Press foil down so that it touches shanks and seal foil completely around edges. Repeat with a second sheet of foil to ensutre a tight seal. Continue to shanks on medium-high until you hear juices bubble. Set pan in oven and cook for 1 1/2 hours. 5. – Transfer pan from oven to stovetop. Arrange shanks on a serving platter and cover with foil to keep warm. Stir beans into pan juices and simmer over 2 burners on medium heat to blend flavors, for about 5 minutes. Serve immediately. I don’t use “cooking wine,” why ruin a good recipe with a lousy wine? In this case I cooked with Mony Cabernet Sauvignon Classic 2009, a great choice. We washed it down with a Herzog Variations Five Cabernet Sauvignon 2012 – which the young couple brought – with aromas of ripened blackberry, notes of blackcurrant and bold blueberry flavors. It proved a superb companion to the lamb shanks. My granddaughter and her husband showed excellent taste in wines. Enjoy gentle reader, enjoy, we certainly did! KFWE 2013 took place on Monday, February 4th, last week. As always the wine selections were superb, the restaurants and caterers exhibiting were tops. Better and bigger than ever, with more people attending than ever. Today we are posting the first of a multi part series of video interviews with winemakers, chefs, restaurateurs and some of the people attending. We segued with our friend, producer of award winning wines, Dr. Moises Cohen owner and founder of Spain’s acclaimed Elvi Wines. After quite a few more interviews we went to the main floor to taste and see what the interviewees were talking about. My favorite was the Clos Mesorah 2009, it tasted even better than last year. On the nose I found it to be rich in blackberry, black cherry, blueberry and floral notes. On the palate it exhibits concentrated and layered fruit, silky tannins, along with plenty of spice, buttered herbs, and good cedar that fills the mouth and makes for a rich and unusual experience, with a long finish of chocolate, vanilla, berries, and butterscotch, with fruit and butterscotch lingering long after the wine is gone. Wooow, we loved it! We will be telling you about the other wines we also enjoyed at KFWE 2013, so… just stay tuned. Meanwhile enjoy, gentle reader, enjoy! 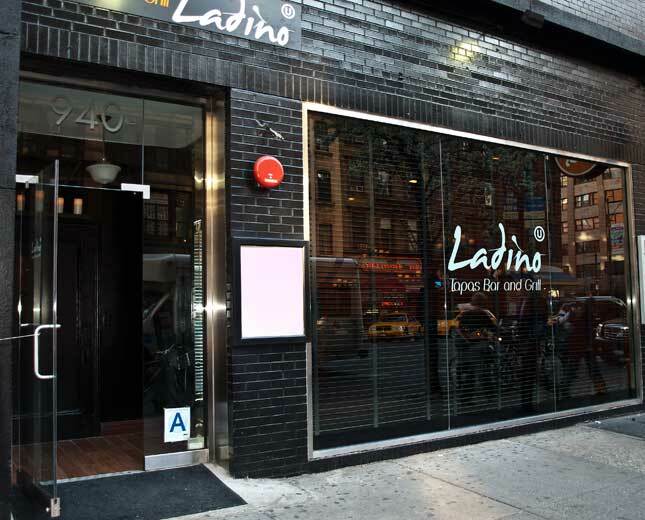 Located at 940 8th Avenue (between 56th and 55th Street) in the Columbus Circle area of Manhattan, Ladino is set to become a new jewel on the crown of New York City’s superb kosher restaurants. 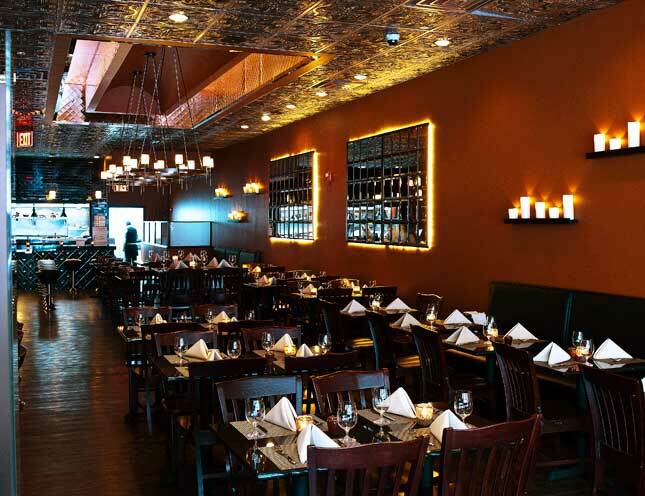 Ladino opened its doors last week on Thursday, this past Tuesday evening I decided to try it out. 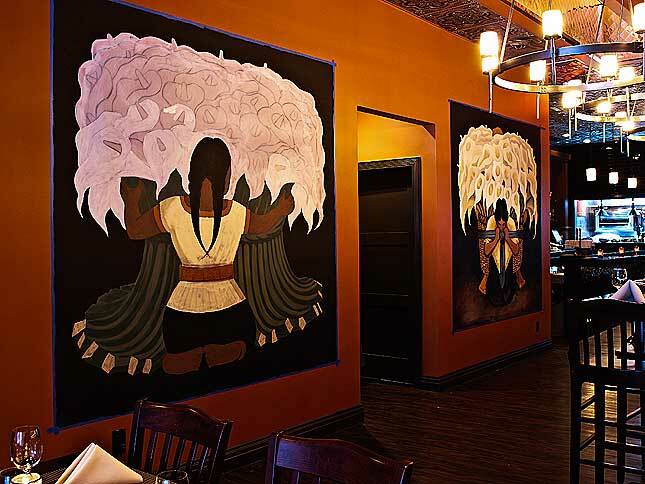 As I walked in, I was immediately struck by its beautifully themed décor, that blended the modern with a traditional but upscale Mexican ambiance. The unfinished Flower Vendor is on the left and El Vendedor de Alcatraces (Calla Lilies) is on the right. The décor was completed with antiqued, floral, copper ceiling tiles. There is a nice modern themed bar at the back but, because Ladino opened ready for Pessach, it only offered wine (mevushal) selections, no beer, no liquor. I came in as soon as they opened for dinner at 5:00pm, so as to make sure there would be few people to get in the way of my taking photos of the place, by the time I left at around 7:30pm it was starting to fill up. Under the direction of Alexandre Petard (who was the extraordinary opening chef at the late, lamented, La Carne Grill) – who has a noteworthy record of having worked at some of New York’s most celebrated restaurants, such as Jean Georges, Lespinasse and Les Halles – Ladino offers a nice selection of Tapas (hot and cold), appetizers and main courses. It was the best guacamole I’ve had in quite a while, very flavorful without extra spices that could detract from the delicate taste. I went on to try samplings of the Ceviche de Atun (Tuna), Ceviche de Salmon, and Ceviche de Red Snapper. None of them showed any fishiness in either flavor or odor, I liked all three. Obviously they were very fresh! I washed it all down with a Binyamina Chardonnay 2011. It was a medium bodied, fresh, fruity, aromatic wine with notes of pear, melon and citrus peel. Light gold with a slight greenish tint in color, though not my favorite choice (perhaps because of its youth) it actually matched the ceviches quite well. 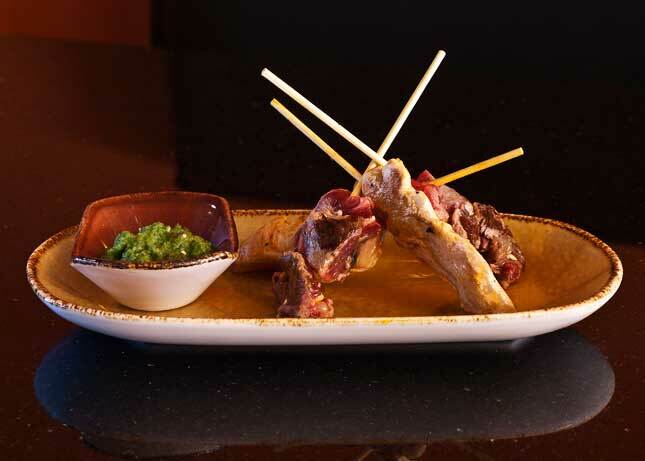 I segued with Pincho Moreno, a set of chicken and beef skewers hot Tapas dish. It normally comes with a house mayonnaise (made to perfection by the French chef! 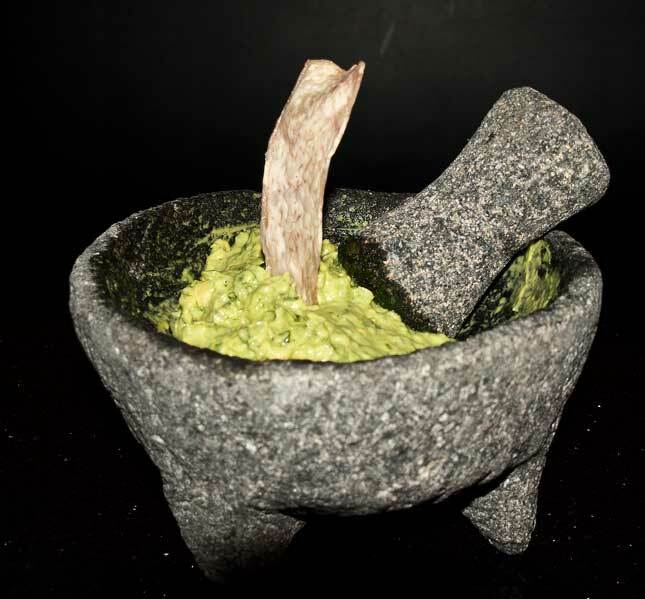 ), but I requested a bit of guacamole as well. While the mayonnaise was my favorite, the guacamole provided an interesting taste variation to the very tender, very juicy, very flavorful poultry and beef skewers. Beautiful to the eye, as you can see above. 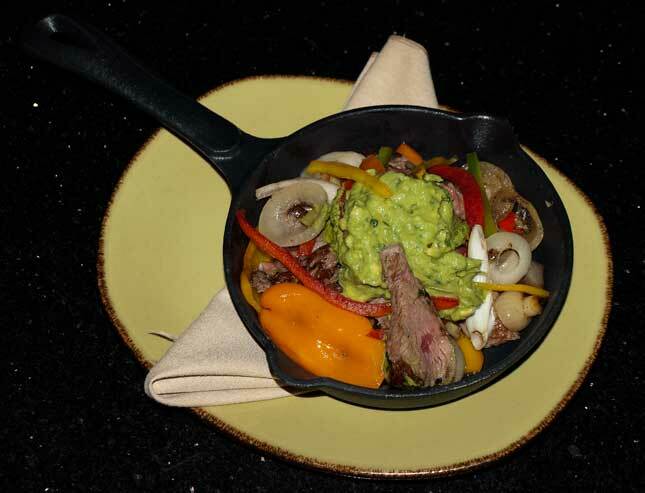 Nicely presented in a cast iron pan seating on a trivet, the steak pieces were surrounded and topped with mixed peppers, onion, mushrooms and guacamole. The aroma was captivating, the juiciness and flavor conjured up the tastiest steaks I’ve tasted in my youth in Uruguay. With the vegetables having absorbed some of the meat juices, the totality of this dish worked like a carefully orchestrated symphony under the baton of one of the world’s great conductors. I washed down these two meat dishes with a glass of red wine consisting of a blend of merlot, cabernet sauvignon and petite syrah. I did not get the name nor the vintage but it was very fruity in its aroma, with strong citrus notes, not so perfectly balanced tannins (again, a young wine), with hints of purple plum and a mild tobacco with a long finish. Interestingly, it paired superbly well with the steak. I crowned the evening with a very nice, parve, mango ice cream (complements of Chef Alexandre… It pays to be among the first customers at a new restaurant!). It was hard to believe it contained no milk, but the ability to substitute is part and parcel of a real French chef’s magic. A perfect place to go out to during chol hamo’ed. As for me, I expect to return after Pessach to see what the regular menu, with far fewer limitations, will be like. Yesterday we told you about the people we interviewed for this evening’s internet radio show, at 7:30pm (Eastern Time); today we will discuss some of our favorite wines. It was great to see some of our old favorites and quite a few new ones. For a long time I’ve been partial to French wines and I was deeply disappointed that Château Guiraud is currently not available as a kosher wine. On the other hand, Château Piada Sauternes 2006, another delightful Sauternes – considerably lower priced than the Guiraud – is better than ever. Everybody agreed on this one! This is a light bronzed gold colored, delicate yet full bodied wine, wonderfully perfumed with honey, crystallized orange peel, apricot and pineapple, on the palate its sweetness is balanced with a racy acidity. Another favorite that never disappoints is Château Pontet-Canet Paulliac 2004, I’d tasted the 2003 many a time and described it on these pages, ahhh! I liked again the Elvi wines, which I first tasted on Sunday evening. The second time around (at a different time of day) at KFWE 2012, they tasted even better! In 2009, I was introduced to Biniamyna‘s The Cave by my good friend, winemaker Asaf Paz. Since then The Cave – Hamaara, has become a favorite and the new vintage (2007) they introduced at the show certainly did not disappoint. Deep garnet in color, on the nose it has strong tones of blackberry and chocolate, full-bodied, with subtly gripping notes of spicy wood it all comes together with currant, blackberry and citrus peel notes. Leaves you with a long finish filled with appealing hints of licorice. As far as I’m concerned The Cave is Israel’s top wine, certainly my favorite and SYR fully agrees with me on this one! My favorite champagne Drappier Carte Blanche was among the French selections I’ve sipped, and this tasting further cemented everything I wrote about it before. I also enjoyed tremendously the Drappier Carte d’Or. It’s got a rich bronzed gold color, with sweet briar on the nose quickly giving way to white peaches, on the palate it shows ripe fruits like peach and apricot with a delightful but very subtle hint of Austrian pastry, all leading to a very long finish. I didn’t get to taste as many wines as I liked (and this post is starting to get a bit longer than my usual ones), as I was taping this evening’s radio show but both Geila Hocherman and SYR tell me that I must at least mention the Shiloh Chardonnay 2009, which both found flavorful, fruity and with just the right balance of sweetness and acidity. Being partial to elegant French wines they loved the Baron Edmond de Rothschild Haut Medoc 2006, with notes of blackberries and tobacco on the palate with a long finish. An oak aged blend of 60% Cabernet Sauvignon and 40% Merlot. It is a medium bodied, dark ruby in color, with soft tannins and gentle wood integrating nicely to show a generous array of cassis, red and black berry fruits with hints of fine herbs, all on an appealingly spicy background. I’ve had this wine before and I have to fully agree with their assessment. So many incredible wines, so little time… Tomorrow we will discuss the food experience at this event. Meanwhile, don’t forget to tune in to this evening’s internet radio show, at 7:30pm (Eastern Time). 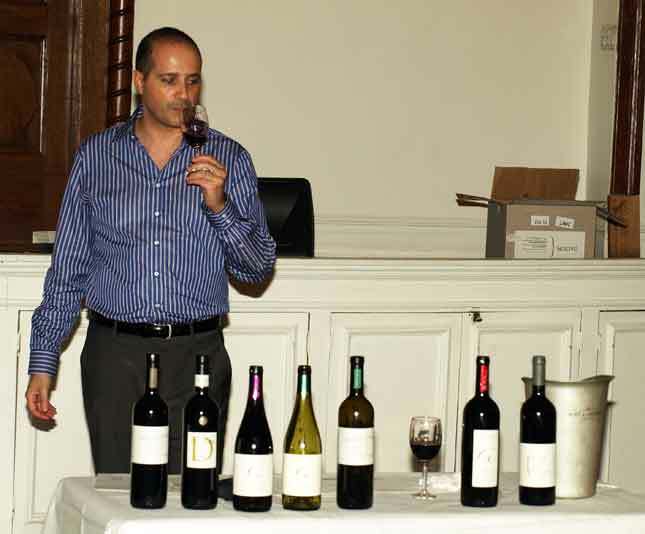 Aron Ritter, from the Kosher Wine Society, organized last evening’s tasting of Israel’s Dalton Winery with the participation of Alex Haruni – the winery’s owner. While the original invitation only listed five wines, Alex brought in nine, each a truly remarkable selection. We started the evening with a Dalton Sauvignon Blanc 2009 – Straw colored, I found it crisp and very fruity with aromas of grapefruit, pineapples and a hint of freshly cut grass. On the palate it exhibits a rich array of citrus and apple blossoms all lingering nicely for a refreshing long finish. Next in line was a Dalton‘s new Alma White 2010 – A delightful wine aged in small French oak barrels with hints of vanilla and chocolate. It was followed by a Dalton Zinfandel 2009 – With grapes originating from vineyards at the foothills of Har Meron, on red clay soil, it is a somewhat spicy wine with berry flavors. The Dalton Alma 2009 consists of: Cabernet Sauvignon – Merlot and Cabernet Franc grapes. Dark, full bodied wine offering nice aromas of cherries, plums and sweet dark fruits; on the palate it shows a buttery combination with hints of vanilla and green tea and rich, yet gently caressing tannins. Then came their Dalton Cabernet Sauvignon Reserve 2009. Dark garnet in color, fruity and with a hint of cigar smoke on the nose, it reveals black and red berries with notes of mint chocolate. It was followed by a Dalton Estate Shiraz 2009. Dark garnet in color, it has silky tannins, lightly spicy with lots of blackberry, red plums and notes of bitter citrus peel. It shows hints of vanilla and leather. Dalton Alma Shiraz Mourvedre Viognier 2009 came next. Deep garnet in color, round and full-bodied, it displays black currant, dark cherries, and tobacco followed by white pepper and assorted berries. Perfect pairing for a perfect steak! A Dalton Estate Shiraz 2009 followed, very dark in color, the nose is intense with black fruit, plums, berries, liquorice, and pepper tones. It has soft integrated tannins and a long finish. We finished the evening with a Dalton Reserve Shiraz 2007, dark garnet in color, medium- to full bodied, developed in new French oak. Opens with a floral and nutty nose, going on to show spicy wood and gentle tannins. On the palate it exhibits a well balanced array of black and purple fruits, nicely complemented by notes of Mediterranean herbs and cigar tobacco. A beautiful tasting with imported crackers and assorted foreign cheeses, grapes and chocolate kisses between the rounds. It proved, once again, how well Aron Ritter and his crew plan an evening of superior wines. Don’t miss the Kosher Wine Society‘s upcoming New Wines For The New Year , this coming Wednesday, the 21st, again at Sanger House 347 West 34th Street, in Manhattan. You may have trouble going back to ordering in a Chinese restaurant after you realize how superior homemade is, thanks to all the glorious Asian flavors. We will never know why Chinese cookies are called Chinese, but we do know they are fabulous! SPECIAL TASTING WITH ALEX HARUNI! Join us for the season’s first sit-down guided wine tasting with Alex Haruni, owner of Dalton Winery. Sign up today to meet Alex and taste his newest wines! Although the price is $65.00 per person for the above tasting, you can a 2 for 1 deal IF you email: info@kosherwinesociety.com AND mention The Kosher Scene Radio Internet Show OR The Kosher Scene blog and my first name (Chaim). at: info@kosherwinesociety.com. You must contact them today, no later than 6:30pm. Tell them you want the 2 for 1 deal. I hope to meet you, gentle reader, I’ll be at both of these events. Our guest this evening on BlogTalkRadio will be award winning documentary filmmaker and author, Joseph Dorman. Mr. Dorman, as founder of Riverside Films has made the award-winning theatrical feature Arguing the World, about the controversial sixty-year political journey of the eminent Jewish writers and thinkers, Daniel Bell, Irving Howe, Irving Kristol and Nathan Glazer and how they shaped the American political debate. The New York Times described it as “enthralling… one of the deepest portraits of… of ideas ever filmed.” Currently, another of his movies is showing around the country and its subject is again a very Jewish one: Sholem Aleichem: Laughing in the Darkness. Check out the schedule of screenings around the country here. It’s coming back to New York in a couple of weeks. Joseph’s work has appeared on PBS, CBS, Discovery Channel and CNN. He will be with us this this evening at 7::30pm (Eastern Time). I found Joseph Dorman to be an interesting conversationalist, someone who loves to deeply research the various subjects he writes and films. You’ll find his subject matter fascinating. I did! Aron Ritter, President and founder of the Kosher Wine Society, will revisit us next on the second half of the show for a discussion of KSW‘s upcoming wine tastings this month. Meanwhile, if you missed our show last week with Martin Davidson, you can hear it here. Please, listen to us this evening on BlogTalkRadio.com at 7:30pm (Eastern Time), I know you will enjoy it! Last Wednesday, the 27th of April 2011, we featured Sara Lasry Leizerowsky. 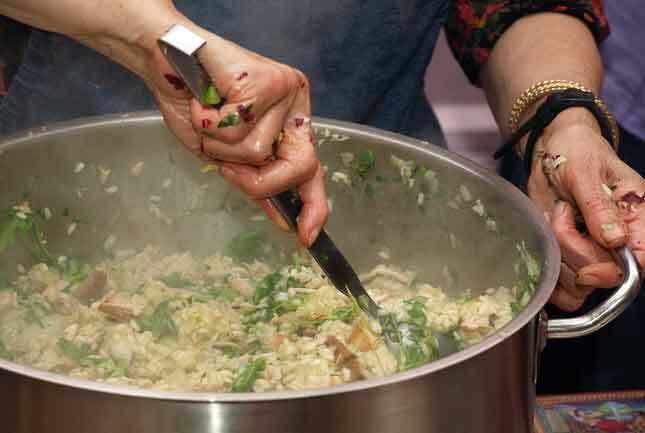 Mrs. Leizerowsky authored two cookbooks (The Dairy Gourmet and The At Home Gourmet, published by Israel Bookshop), for eight years she owned and successfully operated Tastebuds – a dairy restaurant in Lakewood, NJ. Charming and witty, if you missed our conversation when it aired, you can hear the whole conversation on BlogTalkRadio. This evening’s guest will be Aron Ritter, founder and president of the Kosher Wine Society. 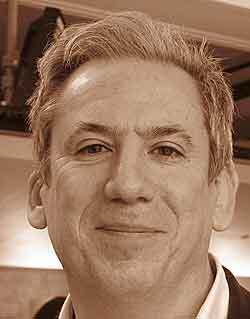 Aron Ritter started the Kosher Wine Society in 2005. KWS has, since then, risen to become synonymous with the best kosher wine workshops presenting potables from around the world, expert speakers and food and wine pairings, including at such venues as some of NYC’s most prestigious kosher restaurants. We will talk about the development of the Israeli wine industry, from biblical times, to the beginning of modern development in the 19th century to today. Mr. Ritter will talk about some of the boutique wineries and some Israel’s international award winning wines. We will also discuss KWS‘ upcoming events. Tune us in here. If you have any questions for Aron, or any comments, we invite you to call in at 714.333.3357. Don’t forget, The Kosher Scene Radio Show, airs tonight from 8:00pm to 8:30pm, Eastern Time. It will be a very informative evening with a discussion of some of the best kosher wines on the market today. We hope your computers will be tuned in to us, as we look forward to hearing from you. Right before Pessach we did a two hour show featuring various wine experts and distributors, talking about kosher wines from around the world. It ended with a half hour conversation with Chef Jeff Nathan of Abigael’s. You can listen to the archived show here. This evening our internet radio guest will be Chef Sarah Lasry. Mrs. Lasry is Food Editor at Binah Magazine, author of The Dairy Gourmet and The At Home Gourmet. For eight years she owned and operated Tastebuds, a very successful dairy restaurant in the Howell/Lakewood area in New Jersey. You can hear our conversation, at 8:00pm (Eastern Time) on BlogTalk Radio. To talk to our guest, or to comment, you may call in at: 714.333.3357, we will be on from 8:00 – 8:30pm. 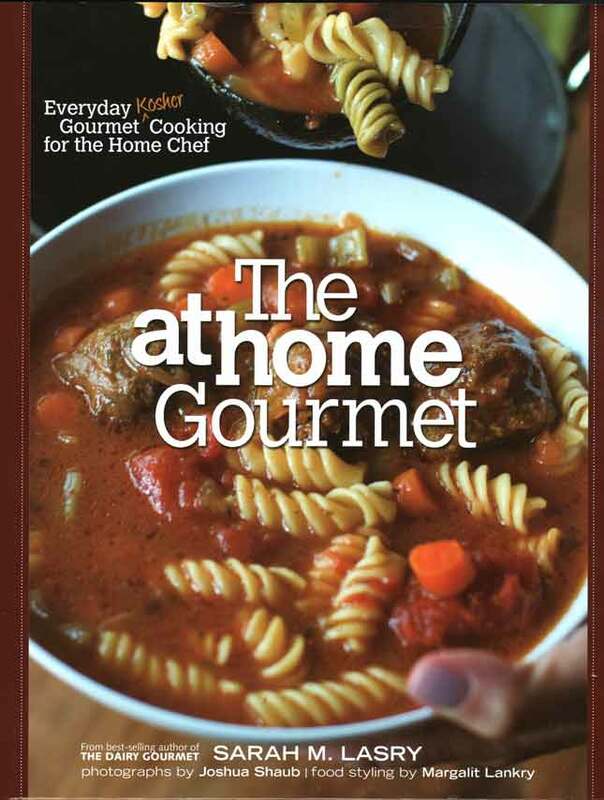 Looking through her latest of cookbook, The At Home Gourmet, I found it well organized and easy to follow. It’s divided in seven sections (Amazing Appetizers, Simple Soups, Zestful Salads, Lazy Lunches, Delicious Dinners, Waist Watchers, Basic Desserts) )and has a well organized Index. Quite a few of its recipes are destined to become new favorites, among them some of the very decadent desserts. In a skillet over med-high heat, saute the onions in olive oil until they have browned (about 4-5 minutes). In a sprayed 9 x 13 baking pan, layer the bottom with the fried onions. Then layer the potatoes over the onions, covering them completely and overlapping the potatoes one on top of the other. In a small mixing bowl, whisk the heavy cream, salt, black pepper and both cheeses together. Pour the heavy cream mixture over the potatoes. In a separate bowl, add the crumbs and melted margarine, mix well and then spread generously over the top layer of potatoes. Sprinkle with a little more cheese and bake the gratin until it becomes bubbly, the top is brown and the potatoes are completely soft, about 20-30 minutes. Let gratin rest for about 15 minutes before serving. Enjoy, gentle reader, enjoy! As for me I plan on pairing it tonight with a well chilled Balma Venetia 2006 Muscat Beaumes de Venise… can’t wait!